Tallahassee: Florida State University launches Civil Rights Institute. Occidental, CA: Peace-justice activist Mary Moore donates personal archive to UC Berkeley’s Bancroft Library. Tempe, AZ: Arizona State University Libraries announced over the next two years, large portions of four of the library's unique archives — putting farm workers, civil rights and LGBT history in the spotlight — will become available online. Lexington, KY: Nunn Center’s oral histories are toast of the Bourbon Trail Welcome Center. Morrison, CO: The Colorado Music Experience archives state music history from John Denver to Johnny Smith. Damascus, Syria: The national antiquities museum in the capital of war-torn Syria reopened its doors after six years on Sunday. A unique photo archive of the NASA Shuttle Program is highlighted in this interview with the photographer John A. Chakeres. Happy Friday, and welcome back to the weekly news! I hope everyone who attended the SFA meeting had a great time, and enjoyed all of the cool stuff Tallahassee has to offer. South Walton, FL - Calling all scuba divers! The Underwater Museum of Art will open sometime this summer. Tempe, AZ - Arizona State University Library will house Senator John McCain Archives. Los Angeles, CA - The Academy announces major collections gift from George Steves, Jr..
San Diego, CA - San Diego Air & Space Museum’s Library & Archives Launches New 100th Anniversary of U.S. Airmail Online Exhibit. Boston, MA - There's a Boston hip-hop memorabilia archive in the works. Sarajevo, Bosnia and Herzegovina - An information center giving access to the war crimes case archives of the International Criminal Tribunal for the Former Yugoslavia opened in Sarajevo’s iconic city hall. St. Vith, Belgium - I want to go to there: the world's only Sourdough Library. "The internet's collective memory has no backup: the Wayback Machine depends on good will and ignorance". The Society of Florida Archivists enjoys being able to sponsor the awards for primary sources at Florida History Day. Every year, one of our members is lucky enough to meet the students in person and award the students with their prize. This year, Burt Altman represented SFA at the Awards Ceremony. 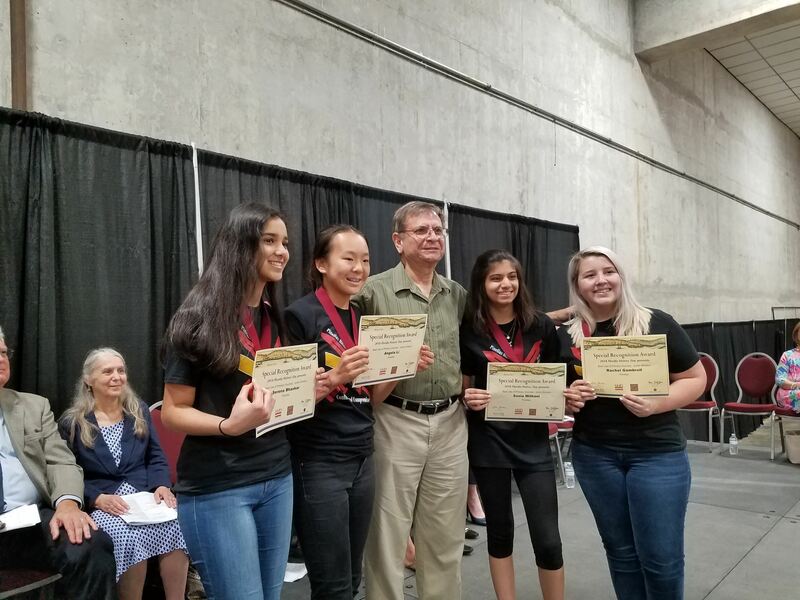 For Best Use of Primary Sources: Junior Division, Rachel Gambrell, Angela Li, Serena Bhaskar and Sonia Mithani from Dunedin Highland Middle School ( Pinellas - Teacher: Teresa Bergstrom) won for their documentary The Partition of India: A Tryst with Destiny, Delivering Conflict with Compromise. 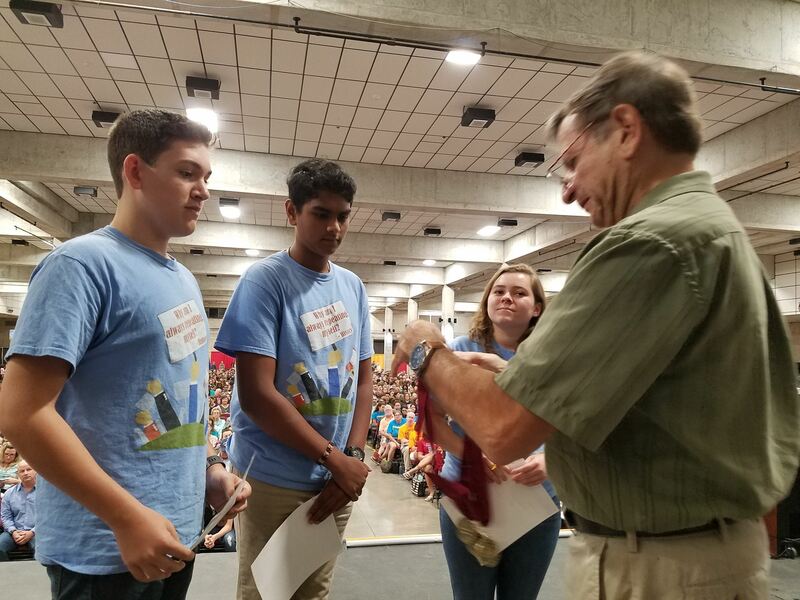 For Best Use of Primary Sources: Senior Division, Manoj Kambara, Logan Beatty and Emily Schuler from Land O' Lakes High School (Pasco - Teacher: Jennifer O'Connor-Podraza) won for their website When Compromise Creates Conflict: The Kent State Shooting Changes the Course of the Vietnam War.